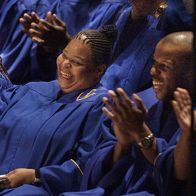 Gregory Branch is a doctor and public health official who also happens to direct an unusual gospel choir in Baltimore. We knew Gregg a number of years ago when we lived in Maryland, and for a little while we even sang in the choir. Gregg is a fiercely kind man with a large spirit and an unusually generous way of sharing his eager intelligence with others. There is a touch of the 19th century about him. He is unflinchingly gracious, even courtly, and he is always perfectly dressed. He is the rare person who looks completely at home and unstudied in a bow tie. But there is also something quintessentially modern in his rapid, open speech and his unfiltered staccato laugh. His smile is definitive, the small gap between his two front teeth working as a kind of doorway, an invitation into a world that might be just a little bigger and happier than yours. It also might be more fun. Once Gregg babysat us at a southeast Baltimore bingo game. We were out of our depth. The hall was filled with rabid, smoking grannies and dry throated men, each surrounded by their own packed little lawns of charms and statuettes meant to bless the cards and bring home the cabbage. Gregg bobbed comfortably in that sea, unhurriedly working ten or twenty bingo cards at once while still keeping an eye on ours, even belting out a hall-filling “Bingo” for Rennie after Rennie had whimpered it apologetically into his shirt collar. The choir Gregg directs is called Unified Voices. It is based out of Johns Hopkins Hospital, a world-class teaching and research hospital located in the heart of one of Baltimore’s most economically distressed neighborhoods. The choir was founded to bring together all of the different kinds of people whose lives intersect with the hospital. Its 90-plus members include neighborhood residents, doctors and other hospital employees, faculty, and medical students. Concerts and productions of Unified Voices can be large and energetic affairs. But rehearsals in our experience often included only a small and variable subset of the membership as a whole. Who showed up when was subject to all the usual vagaries of volunteer dynamics. There might be only a few people in a given vocal section and the mixture changed from week to week. We remember talking to Gregg about this, and what he said has always stayed with us. He genuinely felt that the people who showed up on a given night were the right people. He didn’t worry about who wasn’t there. Each rehearsal had its own set of relationships. Each rehearsal had its own never-before-or-since sound. Gregg was able to work with and take joy in whoever was in the room with him. And he had faith that it would all work out in the end. Gregg’s approach felt intuitively right to us, and we’ve tried to stay true to it over the years whenever we’ve struggled with what seemed like inconsistent or hesitant participation, whether someone else’s or our own. But it was only at a recent Kufunda Village gathering that we began to understand just why such an open, accepting approach makes sense – why it can actually lead to broader participation and deeper engagement. The village was tired. We had just come out of a long and taxing retreat the week before and were once again gathering to try to clarify our focus and strategy for the year. Despite the fatigue, everyone had agreed that the meeting was necessary, even urgent. But it started awkwardly. People straggled in and energy was low. Half the village was missing for various reasons, and as we began there was a restless, leaking quality to the work. People fidgeted, turned away from the centre, wandered in and out. The torque of anxiety increased as we fixed more and more of our attention on the empty spaces around us. Finally, we asked ourselves if it was worth continuing. How could we make progress on major decisions without many of the most vocal and experienced village members present? Maybe it was just stubbornness, but we decided to keep trying. We broke into small groups and began to brainstorm around one of Village’s key projects. And slowly we found our attention turning away from the people who weren’t there and toward the people who were sitting right in front of us. By the end of the meeting, we could sense that something important had happened. The faces in the circle were relaxed and tuned in. We had been hearing from new voices in new ways. We had enjoyed the unfamiliar permutations and watched a new, shy sort of leadership poking its head out from the cracks and corners. People relatively new to the village circles and people who were normally quiet played a much bigger role than usual. We remember that in his choir rehearsals Gregg would ask different people to be soloists almost every night. He sometimes asked them to carry things they might not have felt ready to carry. If you are one of only two basses in the room, you have to sing with a kind of authority you can decline when the section is fuller. Working contentedly with whoever happens to be in the room is not just a way of reducing anxiety or being more present. It also opens space for relationship patterns that might not have room to breathe otherwise. We can begin to access unseen colors and layers of organizational experience and to find new ways of expressing and deepening the organization’s purpose. Missing people can be an opportunity. Absence can be a gift. The first time we saw Gregg directing Unified Voices in front of an audience we laughed in delight at his transformation from the gentle guide of rehearsals to the exultant, uncontained figure we saw flinging himself about in front of the choir. But what was more surprising was the choir itself. The membership was there in force, and somehow those quirky, patchwork rehearsals had crested into a bursting, assured performance remarkable for its coherence. Maybe the secret is to recognize that each seemingly incomplete, fractured moment in our organizations, or in our lives, can offer us an experience of a deeper, more fundamental unity if we learn to pay attention in the right way.